HENRICVS EPISCOPVS TVSCVLANVS S.R.E. CARDINALIS DVX EBORANCENSIS ARCHIPRESBYTER CONSECRAVIT ALTARE HOC DIE XXVIII. OCTOBRIS AN. MDCCLXXXIV. Henry, Bishop of Frascati, Cardinal of the Holy Roman Church, Duke of York, Archpriest, consecrated this altar on the 28th day of October, 1784. In a display case in Room VIII of the Treasury may be found the "York Chalice", sometimes called the "Stuart Chalice"; it is studded with 130 diamonds, said to part of the Sobieski inheritance. 1 One source says that in July 1751 the Cardinal Duke of York (later King Henry IX and I) presented the chalice to the Vatican Basilica, probably to commemorate the fiftieth anniversary of the reign of his father, King James III and VIII; 2 this, however, was a different chalice. The chalice is approximately 31 cms high. The base is decorated with winged cherub heads and roundels of three symbols of the Passion: the veil of Saint Veronica (a relic preserved in the Vatican Basilica), the crown of thorns, and a wine jug (?). The stem is decorated with wheat sheaves. The cup is decorated with roundels of three additional symbols of the Passion: the dice, the cross, and a third image which I have been unable to identify. In the same display case as the "York Chalice" there are two reliquaries which belonged to King Henry. Each reliquary is about 80 cms high and made of silver. The first reliquary contains a relic of Blessed Antonio Fatati, Bishop of Teramo in the fifteenth century. It is decorated in gilt with the arms which King Henry used when he was Duke of York (i.e. the Royal Arms differenced with the crescent, and surmounted by the cardinal's hat). The second reliquary contains a relic of Saint Rufillo, first Bishop of Forlimpopoli in the fourth century. It is decorated in gilt with the arms which King Henry used after his accession (i.e. the Royal Arms undifferenced, and surmounted by the cardinal's hat). The Sacristy and Treasury are entered from the basilica by the door under the monument to Pope Pius VIII. There is an entrance fee. 1 Guide to the Vatican Museums and City (Vatican City: Monumenti, Musei e Gallerie Pontificie, 1986), 187. 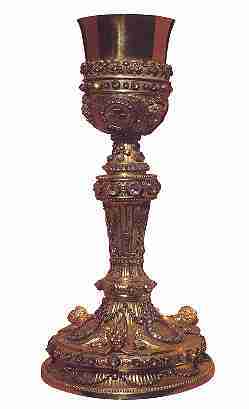 This work wrongly states the chalice was designed by Luigi Valadier, when in fact it was designed by his son Giuseppe. 2 Alice Shield, Henry Stuart, Cardinal of York, and His Times (London: Longmans, Green, 1908), 145. Other sources suggest that this chalice was presented to commemorate Henry's appointment as Archpriest of the Vatican Basilica, but this is clearly incorrect since that did not happen until November 1751. 3 Giuseppe Valadier was born in Rome in 1762, and died in the same city in 1839. He is best known as an architect, although he did do some goldwork like his father Luigi Valadier (1726-1785). 4 Valadier, Three Generations of Roman Goldsmiths: An Exhibition of Drawings and Works of Art (London: Artemis Group, 1991), 122.